If you like thrills and excitement, you’ll want to check out our indoor, two-story Wilderwoods Go-Kart Trail. Located next door to the Glitter Gulch Arcade in the New Frontier region of the hotel. The 525-foot long course offers a total adrenaline rush as you race with your family and friends. Take advantage of our unlimited Go-Kart special, ride as many times as you like for $34.99 during your entire stay! 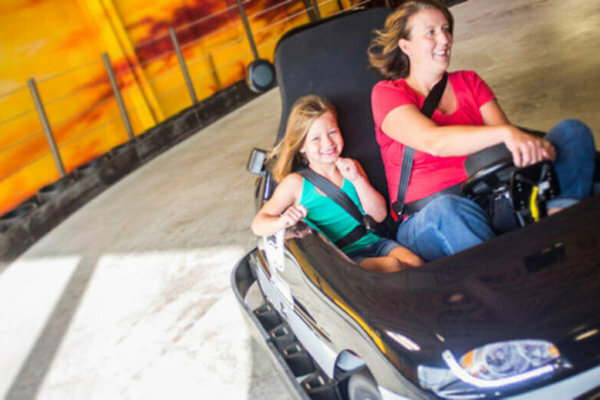 Guests must be at least 56” tall and 10 years old to drive a single or double kart alone. Guests must be at least 60” tall and 18 years old to drive a kart with a passenger. $7.00 - Price does not include tax. $34.99 - unlimited Go-Kart rides during your stay. Please see attendant for more information.